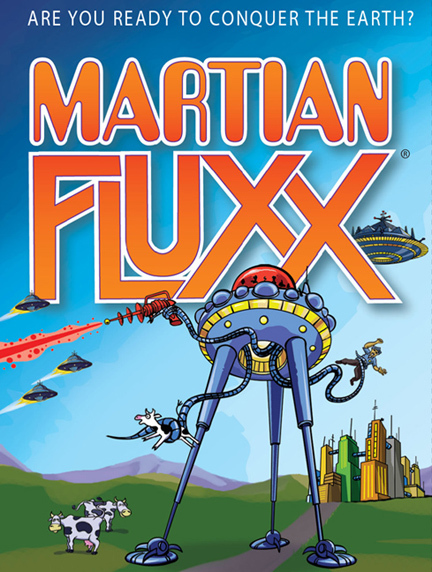 Cover art for Martian Fluxx. Credit: Looney Labs. The Martians have landed. Their goals remain uncertain; indeed, they seem to change continuously: one moment they’re attempting to capture Washington, D.C., the next they’re trying to abduct humans, only to turn their attention to the great cow menace. Of one thing, there is no doubt: once the Martians figure out what they’re doing, we’re doomed. This is the premise of Martian Fluxx, a card game by Loony Labs that’s expands upon the rules of its popular Fluxx card game. As with Fluxx, each player starts with a three-card hand and one initial rule in play: draw one card, play one card. Subsequent cards add more rules, like “Draw 2 cards”, “Play 4 cards” or “Hand Limit 0”. In addition to rule cards, there are “Keepers” like Mars, The Tentacle and The Ray Gun (which you need to collect to the win the game) and Creepers like Pathetic Human and The Army (which prevent you from winning … usually). Finally, there are Goal cards, which tell you which Keepers you need to collect to win. For example “Take Me To your Leader” lets you win if you have the Tripod and the Important Human while “Martian Zoo Keeper” requires a cow and at least two human cards. The original Fluxx was notorious around my house for spawning ever more complex rule sets that rapidly spiraled out of control as ever more aggravating rules got played (e.g. “Draw 5 cards” and “Play 1 Card at Random”, with “Handle Limit 3”, all of which quickly led to lots of card shuffling, and not much game playing). My seven-year-old daughter thought this was hilarious; my wife and I found it annoying. I don’t know if this is supposed to be part of the strategy, but we found ourselves actively trying to avoid playing headache-inducing combos. Moreover game play centered around these different rules cards, but the Keepers and Creepers themselves contributed little to the game other than by providing a means to achieve (or frustrate) Goals. I, for one, welcome our Martian overlords! Thankfully Martian Fluxx changes that. While some Keeper cards remain mundane (e.g. The Earth, The Tentacles), others have special abilities. The “Mind Control Transmitter” Keeper lets you move Human Creepers from one player to another while “Ray Gun” lets you discard any 1 Human Card or move the Army to another player. Meanwhile the “Humans in Black” card lets you win even if you have Human Creepers. The rules cards are also more interesting (and amusing) than the base game. “Human Season” is a rule that lets you discard one human per turn while the action “Destroy All Humans” kills every Earthling at the table. It’s opposite, “Here, Humans” lets you take possession of another player’s Humans. That’s important because while Humans are creepers, and normally prevent you from winning, in Martian Fluxx certain cards use them as part of the victory condition (like the aforementioned “Martian Zoo Keeper”). Fluxx 4.0 – the current base game – can be fun, and I know a lot of people swear by it. My daughter certainly loves it, and it’s one of our go-to games on rainy weekends. But the game never fully clicked for me. Martian Fluxx, on the other hand, does. Between the new Keeper mechanics, the Human creepers, and the rules for manipulating said Human Creepers, Looney Labs has a created a much more compelling and fun version Fluxx. The Keepers add just enough added strategy to break the game out of its rules escalation loop, and the sense of humor is sure to elicit laughs, or at least plenty of chuckles, from players. If your family enjoys science fiction, and you’re looking for a good game to take on the road with you this summer, it’s definitely worth picking up.